Before we ring in the new year, let’s examine where social media is headed in 2015 and what it means for your business. Here are the Top 10 2015 Social Media Predictions (plus a bonus) including the challenges involved for each social network. Taken together these 2015 social media predictions show that you need a multi-platform social media strategy to be competitive. Here’s the social media behavior in 2015 based on GWI research to prove it. 1. Facebook retains its social media marketing dominance. Facebook keeps its social media position due to its broad based audience. This is aided by the fact that a large portion of its user base has installed and uses its mobile app. Facebook remains a people and relationship focused social media platform. Facebook will continue to make business and marketing-oriented content less visible in their newsfeed. Facebook is loosing its key demographic, namely teens and twenty-somethings who think that it’s for kids. As a result, Facebook is becoming the middle-aged network. This will slow Facebook’s audience growth and ad revenues. Facebook will need to find new revenue opportunities. Understand your target audience’s social media personae on Facebook. You must be able to tailor your content to engage them through photographs, videos and interactions. Develop a dedicated Facebook channel strategy. Ensure that you have integrated your Facebook content into your overall content strategy and editorial plan. Plan for Facebook engagement. Have employees (aka dedicated headcount) who are responsible for interacting with your followers. Add targeted advertising to increase your reach. To extend your organic Facebook reach allocate advertising budget and resources to ensure that it’s targeted. 2. YouTube continues to lose video market share to Facebook. YouTube retains its second place position as a social media platform and search engine making it a must in every marketing plan. YouTube must compete with major television and movie studios as well as Netflix, Hulu and Amazon Prime. YouTube will need to focus on its audio offering to compete with iTunes and other podcasting venues. Google’s lack of ability to create non-advertising revenue streams will be a major stumbling block for its business model. At a minimum, YouTube needs a competitive subscription revenue model to capture market share from Netflix, Hulu and Amazon Prime. Create a YouTube channel plan. Include providing one or more of the 5 key content types. Include YouTube in your search optimization strategy. Don’t under-estimate this platform. 3. LinkedIn continues to be a must destination for business of all sizes. Although a major social media platform in its own right: Slideshare, which is owned by LinkedIn, will grow as the premier business presentation showcase. Further, SlideShare allows for the distribution of other content. LinkedIn will have to provide the ability for members to distinguish between their personal and corporate persona. It will also need to plan for new revenue streams, namely from extending their publishing activities. Build an alumni group on LinkedIn. Create longer-term value for your business and employees via an alumni group. Take a page from McKinsey that actively keeps in contact with former employees. It can help you reduce HR fees and get contracts. Develop a targeted LinkedIn channel strategy. Include a combination of content curation, LinkedIn participation and regular interactions. Start a category-related LinkedIn Groups. This can help you extend your thought leadership and help nurture leads. Make your employees shine on LinkedIn. Provide professional photographs and videos to support your employees, especially your sales team. Help craft their profiles. 4. 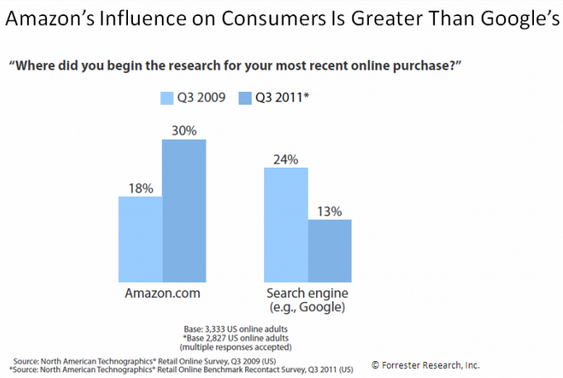 Amazon rocks social commerce. Amazon is recognized as a social media and social commerce platform. Amazon’s place on this list may surprise you because you’ve pigeonholed it as an ecommerce giant. BUT it’s where customers turn first for product ratings and reviews. Amazon is also a search competitor. Amazon has it all. It’s got a large email base and installed mobile app base: it’s an e-commerce platform and distribution channel. Further, it’s one of the top self-publishing platforms. Amazon faces challenges from Google Play and Apple iTunes for mobile visibility and products. To maintain it’s publishing position, Amazon will need to extend to its platform for video and audio offerings. From a financial perspective, Amazon will need to manage competing priorities and quell investor demands for profitability. Build a presence on Amazon. Leverage the power of their publishing platform to extend your content reach. For example, place your ebooks and information on Amazon. Provide relevant advertising (where appropriate). Support your products on Amazon with your advertising budget. 5. Twitter continues to loose market share and importance. Twitter loses its audience growth momentum. While teens like Vines, the short video platform owned by Twitter, it isn’t popular elsewhere. There’s a large amount of noise hindering message communication across the platform. Since many teens use Twitter for private communications, it’s an option for making the social media platform more viable as a corporate offering. Like most social media entities, Twitter is only focused on advertising revenue models. 6. Google+ increases as businesses recognize importance of platform’s Google ecosystem. The biggest challenge is Google. The company hasn’t figured out that it needs to transform its disparate products into a powerful social media platform to complement its search engine. This hits at the core of Google’s business model. Further, data shows that search is losing ground to social media as a means of discovery. Develop a focused Google+ channel strategy to build your following on this social media network. Curate other people’s content as well as your own. Leverage the power of Google hangouts. Where appropriate to extend your reach on YouTube. 7. Businesses will need to associate social media interactions with ROI and resources. 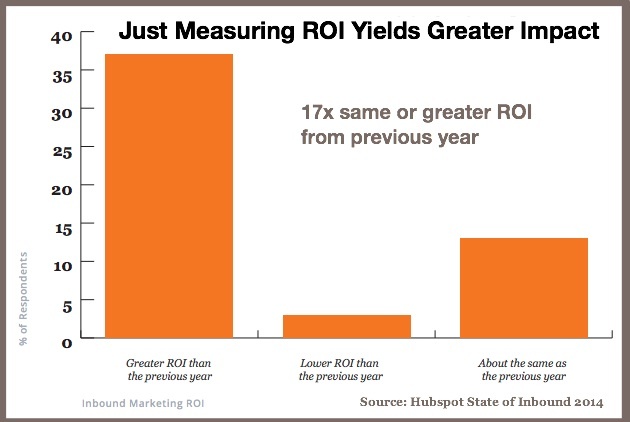 As Hubspot’s Inbound research showed, just the act of measuring results improved content return 17 fold. Most businesses are hindered by a lack of strategic focus for their social media activity. This requires a strategic plan. Focus your metrics on key activities that yield business outcomes, namely sales and ROI. Don’t just measure everything or you’ll be overwhelmed with data and internal analytics. Create a documented social media plan. Don’t just engage. Make sure that your social media activity contributes to your overarching business goals. Determine what social media actions to measure. These metrics must be aligned with your business goals and analytics package. Track all social media related resources. This includes personnel that create content or engage with customers via social media. Incorporate a call-to-action in all social media content. Associate social media content with analytics to aid tracking. Improve on-site conversion process. It’s not just a matter of driving traffic to your website but also ensuring that you can convert potential leads. 8. Instagram continues its growth trajectory. Instagram passed Facebook in terms of the number of photographs in 2014. It will continue on this growth path taking advantage of improved photographic and video technology embedded in a variety of devices. Instagram will need to develop a financial model. Like other social media platforms, it will most likely fall back on advertising. Depending on the implementation, it may hurt usership. Instagram could take a more creative approach to revenue generation. It could charge an annual fee including new filters and other functionality. Get active on Instagram. Show the beauty in your products, employees and customers. Create a targeted channel strategy. Instagram should be an integrated element of your visual content strategy. 9. Pinterest gains traction as commerce destination. Pinterest is the couch surfer’s “I want this” destination. Plus, it’s an important source of traffic for B2B and B2C businesses. With its existing pricing functionality and ability to drive higher average sales, either Amazon or Google will consider purchasing this social media gem. Pinterest will need to develop a monetization strategy beyond advertising. Pinterest is ready made for affiliate businesses. Create a Pinterest channel strategy. Use Pinterest to drive readers to your site. Keep pinned pages alive. Don’t lose potential traffic and sales – redirect visitors to related product or stories. 10. Tumblr maintains its position among teens and twenty somethings. Since being purchased by Yahoo, Tumblr has remained below the radar for most marketers. None the less, this microblogging social media entity will continue to be a platform for young expression. Tumblr must figure out how to leverage the power of being part of the Yahoo empire. This is a tall order since other social media startups have floundered. One area where Tumblr could succeed is as a music publishing entity with big name sponsors. Explose Tumblr’s potential if your target demographic is teens and young twenty somethings. BONUS PREDICTION: A new social media entity will enter the marketplace and make a splash. To succeed, the new platform will be mobile first like Instagram and gain early traction among teens and college students. Snapchat and other small platforms will continue to vie for audience but lose out as yesterday’s platform. The challenge for any new social media entity is to break through and grab sufficient audience to matter. Continue to test the newest platforms. The key to being a player on any new platform is to be an early user and to build your audience. The bottom line: Social media will remain a part of our lives and our marketing in 2015. Niche sites will continue to grow and thrive without reaching mainstream attention. 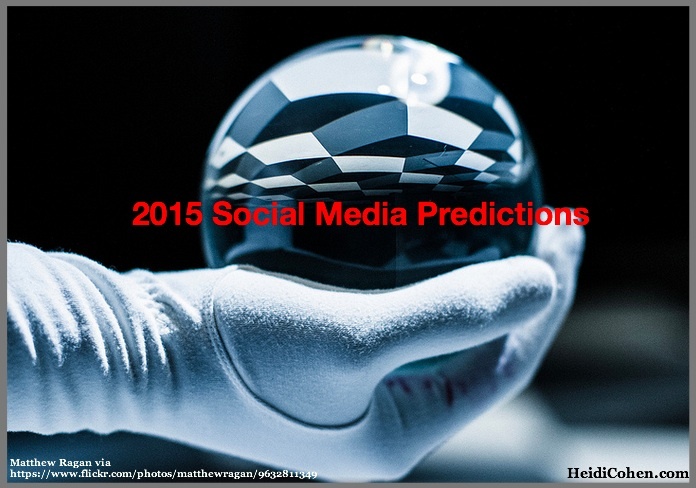 What are your 2015 social media predictions and why? BTW–Here are 67 Social Media Forecasts from 2014 by 27 experts. Tags Amazon, Facebook, google+, Hubspot, LinkedIn, Pinterest, Slideshare, social media ROI, YouTube. Bookmark the permalink. Another excellent post Heidi! Loved it (particularly the bonus prediction). I wrote something similar here (http://www.intouchcrm.com/7-social-media-predictions-2015/) have a look when you have a spare minute.